Very few of the many, many movies with “American” in their titles—“Pie,” “Graffiti,” “Psycho,” “Wedding,” “Beauty” and “Werewolf in London” are a few that come to mind—were christened that way for reasons deeply philosophical. Or psychological. Or cosmological. In most cases, the motive was more likely alphabetical. But “American Hustle” is a story that could only happen here. In fact, in a lot of ways, it’s what we’re all about. It’s the latest from the increasingly virtuosic director David O. Russell, who just a year ago was monopolizing the movie conversation with “Silver Linings Playbook,” a comedy about how love cures mental illness—something a lot of people didn’t seem to notice, because the performances were so sound, funny and touching. “Hustle” is not about how love makes your brain better. But it is about perception, and it puts a new spin on the American dream of reinvention—something that has been carried through our national DNA via Jay Gatsby, Charles Foster Kane, Amy Semple MacPherson and Richard Nixon and no, there’s no point differentiating between the fictional and nonfictional, because in America—and “Hustle”—the point is often that there is no difference at all. The film is also what we would like to call a scam-edy, a mix of jocularity and plot twists, of the type that has powered starry Hollywood vehicles like “The Sting,” movies in which the acting, characters and glamorous patina are so distracting that viewers won’t notice till the end—if they even care—that they’ve had their reality hijacked by a brilliantly constructed con game ABOUT a brilliantly constructed con game. That con game is NOT Abscam, although the dubiously constructed FBI sting operation of the late 1970s and early ’80s provides the skeletal structure for Russell’s movie. He’s not religious about it (“Some of this actually happened,” reads the film’s opening title), but the marginal fact-baseness of “American Hustle” does allow him to get away with a lot of fantastic events, and more fantastic characters. Chief among them: Irving Rosenfeld (Christian Bale), the owner of an elaborate, architecturally precarious comb-over (its preparation provides the film’s opening movement, and metaphor) and a paragon of reinvention: Having watched as a child while his father was ruined in business, he’s grown up determined never to be a sucker, or to give one an even break. He finds his soul mate in Sydney Prosser (Amy Adams), an equally self-made scam-artist who shares Irving’s instincts, and passions—they bond over Duke Ellington’s 1956 Newport recording of “Jeep’s Blues,” a celebrated performance that mixes soulfulness, sentimentality and a certain blues-based scam-artistry by sax man Johnny Hodges in the same precariously balanced way that defines Sydney and Irving: They love each other, but they’re also on the make. And they’re very good. They’re so good, in fact, that the idea that they’d ever get caught requires the biggest suspension of disbelief the viewer has to make. Erecting their phony bank-loan operation on the strength of Irving’s patter and Sydney’s allure—she becomes Lady Edith Greensley, who has “banking connections in London”—they never overreach, unlike Richie DiMaso (Bradley Cooper), an overly ambitious FBI agent who seems to find them out only because he has so little to do and so little direction from his superiors (played with aplomb by Louis C.K. and Alessandro Nivola, who seems to be channeling Christopher Walken). Richie wants to make a name for himself, and cuts a deal with Irving: Take down four bigwigs and Sydney won’t go to prison. Thus Abscam is born, and “American Hustle” set on its rollercoaster track. Did we mention Irving was married? Yes, to the delightfully unstable Rosalyn (Jennifer Lawrence), a woman whose pretzel logic, wonderfully half-baked by Russell and his co-writer Eric Singer, makes her the biggest con artist in the movie. She’s the type who intimidates with unpredictability, inappropriate remarks and a proclivity for setting the kitchen on fire. Irving would seem to be immune to sentiment, but that’s part of the con that is his life. He’s adopted Rosalyn’s son, loves him and allows his wife to use the child as a bludgeon and handcuffs. According to Ms. Lawrence herself, who will surely be nominated for another Oscar this season (she won last time for “Silver Linings Playbook”), Rosalyn does awful things for the best reasons: To keep her marriage together, she’ll make Irving miserable. And rationalize it till it works. He, meanwhile, is constructing a scheme by which Richie can take down some congressmen, a con involving New Jersey’s freshly minted gambling laws, the as-yet-unrestored Atlantic City, and the mayor of nearby Camden, Carmine Polito (Jeremy Renner). Carmine is another hustler whose hair makes a statement, an airborne pompadour, in this case, and who, despite a slightly felonious nature, is a good guy: He loves his wife, has a house full of kids and really cares about Camden. Irving really cares about Carmine, and the fact that he has to throw the mayor under the bus to save himself and Sydney adds a note of the tragic to what is otherwise pretty hilarious comedy. But that’s how you make great movies, something Russell is doing with remarkable consistency. The movie-ness of “American Hustle” is a delight—Russell, a student of early American cinema, borrows lavishly from the likes of Frank Capra and Preston Sturgess (Capra’s optimism/cosmic justice; Sturgess’s absurdist sensibility) and exercises a visual audacity that rivals Martin Scorsese’s. The elaborate storyline that underpins “American Hustle” is also Scorsese-like, but similar too is Russell’s ability to present us with characters and personalities—Bale, Adams, Lawrence, Cooper—who charm us through the thickets of implausibilty that inevitably crop up in a movie so baroquely plotted. 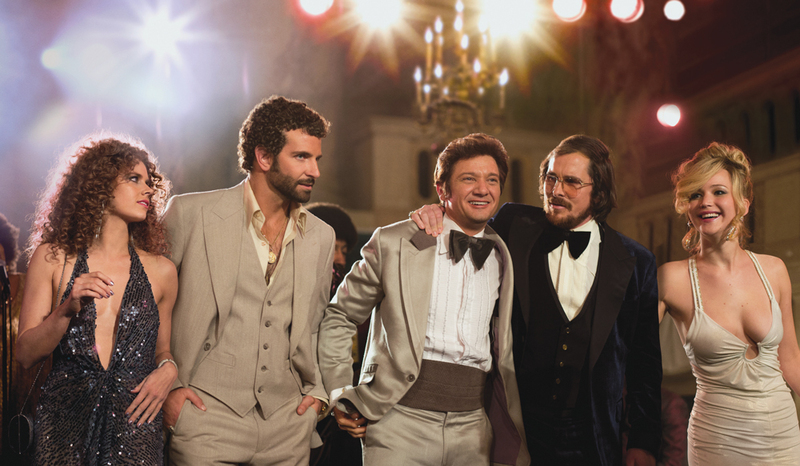 As a friend remarked after seeing the film, ‘“American Hustle’ has everything” and it wasn’t an idle observation. Few are the films that can be described as profoundly artistic and deliriously entertaining, substantial and soufflé-like. Noble, and screwy. It’s not the worst way to start a new year. This article also appeared in print, under the headline "'American' Made," in the February 3, 2014 issue.